Robert Ross paints with oils on canvas. His art-making focuses on urban and rural landscapes. He often paints on the scene alla prima, seeking to capture light and color in one attack. He has a special interest in the way man-made and natural forms interact with each other. His paintings are characterized by his use of light, shadows, color, simplified forms and painterly brushwork. Award of Merit in Painting at 2015 Winter Park Autumn Art Festival. Selected for one-year Artist in Action studio artist program at Maitland Art Center, Maitland, Fla.
Award of Honor in Painting, at 2013 Winter Park Autumn Art Festival. Seventeen paintings in “Under Roof and Sky,” three-month solo exhibition at Winter Park (Fla.) City Hall. Three paintings in “Small Works by Central Florida Artists” exhibit, at Anita Wooten Gallery, Valencia College east campus. Two paintings, “Fence Posts” and “Yard in Daytona Beach,” in Art in the Chambers exhibit at Orange County Commission Chambers. Participating artist in 2012 Winter Park Paint Out, sponsored by Albin Polasek Museum. Featured cover artist in Winter Park Magazine, Oct. issue; included 3-page interview with paintings. “I-4 and Orlando,” 11"x24" oil painting, jury-selected and exhibited at Orlando Museum of Art (Orlando, Fla.) in “Citiescape” show. Exhibited 12 paintings in outdoor booth at Hannibal Square Art & Folk Festival, sponsored by Crealde School of Art’s Hannibal Square Heritage Center, in Winter Park, Fla.
"The Way Home," 18"x24" oil painting, jury-selected and exhibited in “Paint the Town” show at Gallery at Avalon Island (Orlando), sponsored by Orlando Magazine. Painting included in feature article in the magazine about the exhibit. Studio Artist in Painting and Drawing for 2011 at Crealde School of Art, Winter Park, Fla., a position awarded by school's faculty in a competitive process. Three-month exhibit of landscape paintings at Art Affair Gallery, Sanford, Fla. 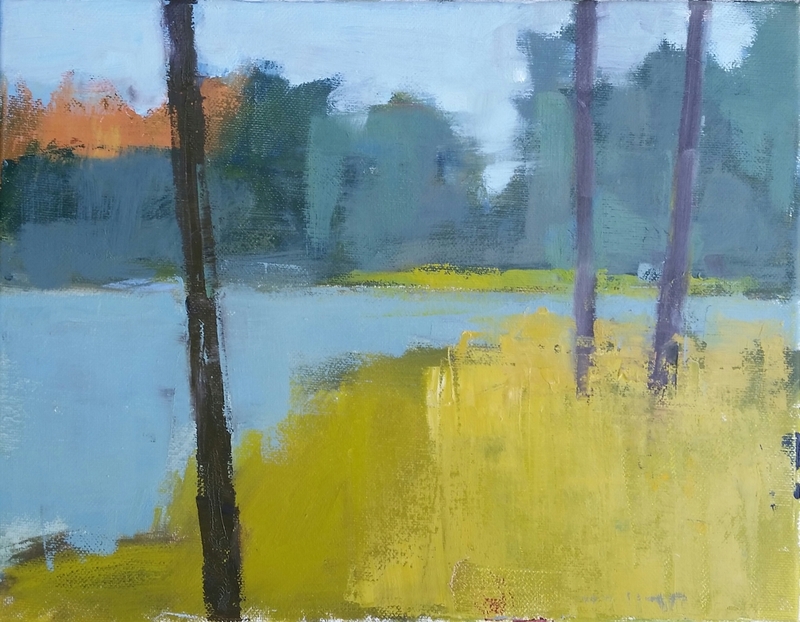 Three-month exhibit of landscape paintings at Art Affair Gallery, Sanford. Two-person show, "Street Seen," at City Arts Factory, downtown Orlando. Exhibited oil paintings of urban landscapes, streets, and highways of Orlando area. First Prize in Painting and Drawing from Crealde School of Art for "The Way Home," 18"x24" oil painting. Painting was also exhibited in the school's juried 2010 Student Show, held in June and July. Painting jury-selected and exhibited in Paint the Town show at Gallery at Avalon Island (Orlando), sponsored by Orlando Magazine. Painting also included in feature article in the magazine. Two paintings, "Royal" and "Shimmer," both 12"x12", selected for juried 2009 Student Show at Crealde School of Art, June and July 2009.